Cold, dark mornings. Ice and snow. Nagging injuries or mental burnout. 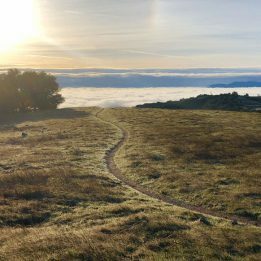 Though the idea of running anything short of 12 months out of the year might seem antithetical to some runners – and to a running magazine – there are plenty of good reasons people don’t run on trails in the winter. Still, that doesn’t mean you have to sit inside and let yourself get out of shape. 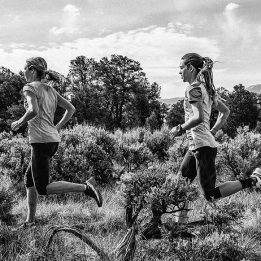 These days, more and more runners seem to be hitting the trails during their “off-seasons” thanks to growing sports like ski mountaineering (“skimo”) and fat-tire biking, as well as older standbys like Nordic skiing. We spoke to two runners who know these winter alternatives well about their benefits, drawbacks and kit requirements. The basics: You use alpine skis with climbing skins to ascend a mountain, then clip your heels in and enjoy the fruits of your labor by skiing down. More-dedicated backcountry skiing can require strapping your skis to your back and climbing, mountaineering-style, in your ski boots. Benefits: “Skimo mimics mountain running really well,” says Michael Stearns, 27, who works at Gear West Cross Country Ski and Run in Long Lake, Minnesota, and who used to skimo regularly in Montana and Vermont. “There’s cardio, because you work really hard going up. But you’re also strengthening those muscles you need for downhill running when you’re skiing down. Drawbacks: For one thing, skiing rapidly down the side of a mountain holds the risk of a kind of injury usually foreign to runners: traumatic. Falls can break bones and tear ligaments in your knee, leading to extended time off of both skiing and running. Be careful, and consider how much you are willing to risk the next year of running! For another, it’s hard to pull off regular skimo training unless you live near real mountains. And if you do, their snow conditions provide the very real risk of avalanches, which kill even experienced skiers every year. What you need: Alpine skis, poles, boots and bindings are all requirements, and unless you have skis designed with scales on the bottom for uphill climbing, you’ll also need removable climbing skins. The type of ski, boot and binding can depend on how versatile you want your set to be – will you be skiing in powder, training for a race, or both? – though most boots feature a “hike” setting that makes them more flexible, allowing for longer and more efficient strides while climbing or traversing. Additionally, while the aerobic output of climbing will have you working up a sweat, skiing downhill requires a very different set of clothing than does winter running. Waterproof pants, jackets and gloves are standard – layer smartly for the different conditions and activities. Goggles are all but necessary for flying downhill, as is a helmet. On a budget: Lots of your equipment – mainly clothing – can be found used without an issue. But it is important for functionality and fun to have skis and boots that fit properly. Getting fitted at a specialty ski shop can cost a lot of money but guarantees a good fit. Unlike running shoes, undamaged used skis are often just as good as new. Getting your equipment at a ski swap will save money but requires some luck in finding equipment that fits. Slightly less exciting, but more similar to the act of running, is cross-country, or “Nordic,” skiing. The basics: Split between “classic” (where you mimic a Nordictrack motion, pulling with your skis in parallel rivets in the snow) and “skate” (where you propel yourself with skis and poles pushing off to the side), Nordic skiing offers a variety of high-aerobic workouts without the impact of running. Benefits: Unlike running, Nordic skiing offers a full-body workout, says Stearns. 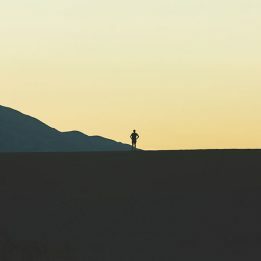 “You’re strengthening your whole core, including all those stability muscles, which really helps when you’re transitioning back into running,” he says. Stearns also says the classic technique is easier for runners to pick up: “The stride is more similar, there’s less emphasis on timing and it will feel more natural to a runner.” Meanwhile, the skate technique, while more challenging, offers the chance to work harder and see more fitness gains. Nordic, unlike skimo, is accessible to runners in areas of the country that are far from the mountains but receive plenty of snow. Drawbacks: The biggest drawback here, as with skimo, is probably the startup cost, though you might not need to buy as many new clothes for Nordic. While the risk of traumatic injury is lower than with skimo or biking, and the risk of repetitive injury is lower than running due to less pounding, a crash on a downhill section is still possible. What you need: Skis, poles and boots; that much is obvious. But how do a Nordic skier’s clothing needs differ from those of a winter-ready runner? Nordic skiing is a high-output aerobic activity, so a lot of your winter running gear will work here. “Your base layers and midlayers are similar to running,” says Stearns. “But your outerlayers are different, especially when it comes to your lower extremities.” Higher speeds mean you’ll need more wind protection. Many brands make a pant that is windproof in front and well-ventilated in the back; Stearns says this is a worthwhile investment if you plan to ski a lot. Also, because you’ll be gripping poles and your hands won’t be able to generate as much heat for themselves, sturdier gloves are recommended. A popular design is a “lobster” mitt, which groups fingers in twos to maximize both heat and mobility. On a budget: To an even greater degree than skimo, proper fit is crucial to one’s enjoyment of Nordic skiing, so it may be worth springing for skis that fit at a specialty shop. 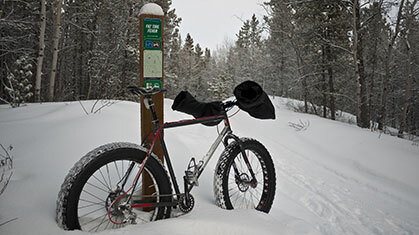 The large surface area and low tire pressure of fat-tire bikes, which allow for superior traction and flotation, make them a favorite for snowy singletrack. The basics: Fat-tire bikes are slower-moving but easier-to-control versions of standard-tire mountain bikes, making for a lower crash risk and fun but challenging winter sessions on the singletrack. Their tracks often groom the trails after a fresh snow. If you enjoy running in their smooth wake, thank a fat-tire biker. Benefits: You get a lot of aerobic bang for your buck biking in the snow, says Paul Zeigle, 49, the brand manager at Bloomington, Minnesota-based Surly Bikes, one of the original mass producers of fat-tired bikes. While cycling often requires up to twice as long to gain the same-quality workout as a run, that’s not the case here. “With snow you get a much harder workout for the amount of time or distance you travel,” he says. “If you try to coast you generally slow down or stop due to resistance. Drawbacks: Though the low-pressure fat tires are inherently very stable, there is still a risk of crashing, especially where the snow is covering up icy singletrack. Zeigle says that while slippery conditions can help build technical skills, novice riders might want to avoid more technical sections of trail. A broken clavicle would put a damper not only on your running, but on most methods of cross-training. What you need: As with Nordic skiing, your base and midlayers will be the same as for running. Depending on wind, you might not even need much more than the pants or jacket you already have for running. It can get windier, but slow movement in the shelter of the woods often mean less windchill than skiing, Zeigle says. And lastly, of course, you’ll need a helmet. Zeigle recommends a ski or snowboard helmet, or a bike helmet with a headband, winter hat and/or winter Buff to keep warm. On a budget: Even compared to the other recreational media mentioned here, fat-tire bikes can be expensive. If you’re on a budget, shop around – whether online, in a shop, or from cycling communities on the Web, it should be easy to find a bike below sticker price. Be careful, though, as an improperly fitted bike can lead to knee injuries and a generally uncomfortable experience.